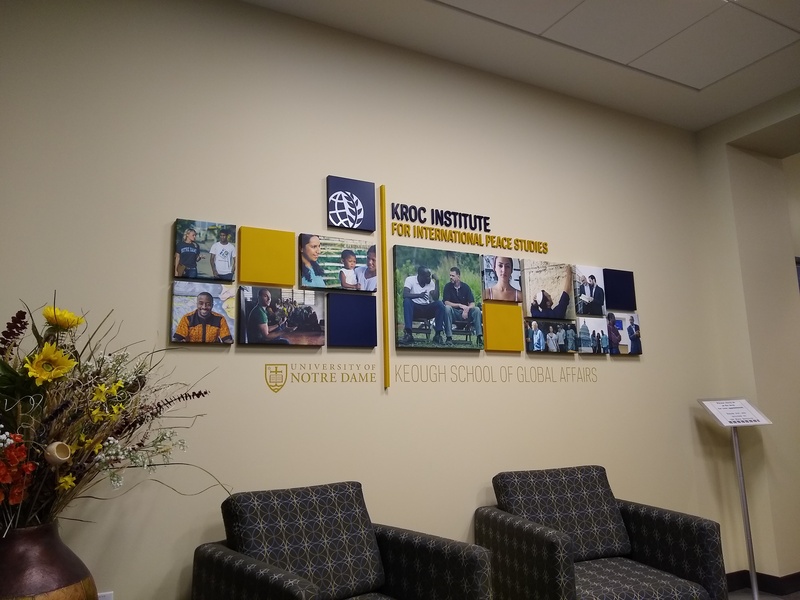 I’ve had the pleasure the last few days (3/21-23/19) of being hosted by the Kroc Institute for International Peace Studies at the Keough School of Global Affairs at the University of Notre Dame in South Bend, IN. The Kroc Institute was established in 1986 through the generosity of Joan B. Kroc, the widow of Ray Kroc, the founder of McDonald’s. I was invited by Susan St. Ville who directs the master’s program at Kroc. I was there to share with students career pathway strategies. This was the second time I had been at Kroc, the first in 2008 when I was at USIP and invited by George Lopez,who is professor emeritus at Kroc. While at Notre Dame, I met with students one on one, as well as held meetings with undergrad and graduate groups. Meeting with students individually is one of the most satisfying things that I do. It is sometimes difficult to make generalizations about strategies to find work today. By meeting one on one, I can tailor recommendations to a student’s needs and their background. I arrived on Thursday and had a few one on one meetings, but spent most of date day with undergrad peace studies students. They were students of Anna VanOverberghe. Though a small group, the students represented the increasing trebd to become “boundary crossers” (a term developed by Daniel Pink). Grace is a senior at Notre Dame and is studying anthropology and peace studies. Brendan is focusing on business analytics and peace, while Elsa is studying biology and peace studies. Increasingly issues of peace and conflict will require professionals with “intersectional” backgrounds. The new frontiers of conflict will bring together fields and disciplines not naturally aligned, but fused together because of climate change, technology, market forces, or biological changes. For example, we have only recently come to recognize the impact that climate change is having on migration. As the seas rise and deserts expand, marginalized groups will flee to areas where they might not be welcomed and are crowded. This leads to conflict. Grace, for instance, is looking at refugee issues, while Elsa is exploring climate change. On Friday, I met with Susan St. Ville’s 1st year master’s students. These students in July will engage in 6 month field internships working in peacebuilding NGOs and organizations in the U.S and abroad. Kroc’s ability to integrate a meaningful experiential activity is commendable. Having students experience and apply their learning to the world of work is critical for developing their professional identities. I don’t know of another master’s program in the field that is as committed to experiential learning. Craig Zelizer and I (with other colleagues) in 2010 published a special report for the U.S. Institute of Peace (SR 246) that urged programs to take the approach that Kroc has implemented. Acceptance into the master’s program is competitive. These students are from Egypt, Costa Rica, Nigeria, Turkey, Kenya and the U.S., as well as other countries. They will be working with groups such as Creative Associates in El Salvador, Catholic Relief Services in Baltimore, and the Life and Peace Institute in Kenya. My talk looked on how they might prepare for this experience. I emphasized the need for engaging not only with their organization, but learning about other groups and entities where they are working in. I also reminded them that they will have good days and bad days, and that learning is sometimes best when things don’t go as planned. Later in the afternoon, I had a session for all students at the Kroc Institute (including 2nd year master’s) as well as other students in the Keough School. Here, I talked about ways to advance their career. I started off by discussing the changing nature of work including the difference between an employee and contractor. Many will work in the new “gig” economy which brings with it challenges and opportunities. We discussed the importance of networking, especially one on one with mentors and others in the field. It’s often hard for students to get up the nerve to ask to meet for coffee, but I find most professionals are generous with their time. This is the best strategy to finding work. My one on one sessions were the most meaningful. I found the Kroc students to be exceptional: many having significant experience before starting the program. I was glad I was able to connect several with colleagues in the field. And many were already connected with professionals that I know. Anxiety about the future is an ever present reality. Because many are international, deciding whether to return home or try to stay in the U.S. is a major concern. Many have brought their families with them to Notre Dame, so future decisions can be complicated. I was impressed with them all. They epitomized the social and global concern to make change that is at the core of our work. Djiba from Mali is here with his wife and 11 month old daughter. He received his undergrad degree from Utah Valley University. He is committed to returning to Mali to advance peace especially as it relates to gender and women. Mary from Kenya is off to Baltimore in July working for Catholic Relief Services. She will be focusing on protection work, and hopes to make a difference in her community back home one day. Rana from Egypt is going to Beirut to work for Mercy Corps and hopes to apply her knowledge of monitoring and evaluation to improving peacebuilding development outcomes. And Nate from Seattle is off to Geneva, working for ICAN to understand the work of ending nuclear proliferation. I was glad to spend some time with them. I always learn much more than I offer to them. Fostering the next generation of peacebuilders and conflict professionals is rewarding for me. Mentoring is critical to advancing our work, and I urge my colleagues to make a commitment to this. On my way back to DC on the flight from Chicago, I sat next to a group of students in the State Department’s YES Exchange Program which brings international high school students to the U.S. They all living and studying in Iowa and are on their way to DC for a conference of all YES and FLEX Program students. What a great experience for them! Study abroad is so important for increasing international understanding and peace. My daughter is currently in Korea on study abroad from Towson University and my son, while at the University of Maryland, studied in Turkey (and just returned from the Peace Corps).